The Washington Capitals, among the league’s streakiest teams of late, try to end one streak and start another when they host the New York Islanders on Friday night at Capital One Arena. The Caps go into this game carrying the weight of a three-game losing streak, their second three-game losing streak in less than three weeks. The Islanders were scheduled to host the New Jersey Devils on Thursday night, taking a tw0-game winning streak into that game. The last month has been rather kind to the Isles, who are 12-3-0 through Wednesday since beating the Detroit Red Wings, 4-3, in a Gimmick on December 15th. That is the best record in the league over that span of time, pending the Islanders’ outcome against New Jersey on Thursday night. The offensive spark for the Islanders in this extended run of success has been provided by Mathew Barzal, who has a hand in 18 of the 50 goals scored by the Islanders over their last 15 games. The production includes a team-leading 10 goals in addition to eight assists, including a hat trick in a 4-0 win over the Toronto Maple Leafs on December 29th. Barzal has been especially productive on power plays over this stretch of games, going 3-4-7, figuring in almost all of the team’s nine power play goals in those 15 games. Barzal set for himself a very high standard last season, when he went 22-63-85 to win the Calder Trophy as the league’s top rookie. He has produced at a comparable pace this season, going 13-30-43 in 45 games through Wednesday. Keeping him off the score sheet is important. The Islanders are 19-7-3 in games in which he recorded at least one point this season, 9-2-0 in multi-point games. Barzal is 1-3-4, minus-3, in six career games against the Capitals. The Islanders have veterans on defense – Nick Leddy and Johnny Boychuk have a combined 1,254 regular season games of experience through Wednesday, for example. But over the last 15 games, it is Devon Toews who leads the defense in goals scored (three, tied with Boychuk). Most impressive about that fact is that he has done it over a span of just 11 games, scoring all three goals since he was recalled from the AHL Bridgeport Sound Tigers in late December. His first goal was a memorable one, coming in the Islanders’ first game of the new year. Toews scored in overtime to give New York a 4-3 win over the Chicago Blackhawks (and no, he is not related to Blackhawk forward Jonathan Toews). Coincidental or not, Toews has been something of a good luck charm. The Isles are 9-2-0 since he was called up. What he has not yet done, though, is make his presence known on the road. While he is 3-0-3 in six home games, he is just 0-1-1 in five road contests so far. This will be his first career appearance against the Caps. Robin Lehner has been so hot in goal lately that there is the danger of melting ice in his crease. In New York’s 12-3-0 run, he is 9-1-0, 1.46, .951, with one shutout. Even his lone loss was impressive, stopping 24 of 26 shots in a 2-1 loss to the New York Rangers. It is quite a turnaround for Lehner, who before going on this run lost six straight decisions (plus a no-decision) over a month-long period from mid-November to mid-December (0-4-2, 2.87, .891). After starting his career in Ottawa, without establishing himself as a number one goalie over five seasons with the Senators, and a three-year stint with the Buffalo Sabres, during which he serve in the number one role in his last two seasons, he appears to have found a home with the Islanders. His goals against average to date (2.16) and save percentage (.928) are career bests for any season in which he appeared in at least 20 games. Lehner is 1-3-1, 2.60, .913 in five career appearances against the Caps. 1. How impressive is the Islanders record to date? Only once since 1983-1984 have they had more wins through 45 games (as of Wednesday) than the 26 recorded this season. They had 30 wins at the 45-game point (tying the team record) in 2014-2015. 2. If the Islanders score three or more goals on the road, they win. They are 12-0-0 on the road when scoring three or more goals. On the other hand, they are 2-8-1 on the road when scoring two or fewer goals. 3. The Isles have shown a willingness to sacrifice in their 12-3-0 run through Wednesday. Their 248 blocked shots rank second in the league (Philadelphia has 267 blocked shots through Wednesday) over that span. 4. The Islanders and the Winnipeg Jets are the only teams in the league to allow only one goal in overtime this season. New York gave one up on a power play in a 3-2 loss to the Florida Panthers on October 24th. 5. The Isles are upside down in one area – scoring first. When scoring first, New York is just 14-7-4, their winning percentage of .560 tied for 23rd in the league. On the other hand, the Islanders are 12-8-0, their .600 winning percentage ranking third. 1. The Caps have had seven different defensemen record at least one goal this season John Carlson, Matt Niskanen, Michal Kempny, Dmitry Orlov, Madison Bowey, Brooks Orpik, and Tyler Lewington), matching the total from last season. 2. The Caps are one of three teams in the league with two defenseman having a plus-20 or better (John Carlson is plus-22; Michal Kempny is plus-25). Toronto and Calgary are the other clubs. 3. The Caps, despite troubles lately, still have the second-best home power play in the Eastern Conference (26.8 percent). Boston is at 33.8 percent. 4. Through 46 games, the Caps have scored first 23 time and given up the first goal 23 times. They are a top-ten team in winning percentage in both scenarios, fifth when scoring first (.739/17-6-0) and eighth when allowing the first goal (.435/10-8-5). 5. The Caps have out-shot opponents only 16 times in 46 games so far. This bears watching because the Islanders are one of the few teams that have out-shot opponents fewer times (15). The Caps are the superior team in those situations, a 9-4-2 record to the Islanders’ 5-9-1. Anders Lee is a go-to player for the Islanders. His 16 goals is tied for the team lead (with Brock Nelson). His eight power play goals leads the club. And, his three game-winning goals are tied for the top spot (with Valteri Filppula and Jordan Eberle). He does it despite being only fourth on the team in average ice time (17:16 per game), although he does get top power play minutes (3:08 per game, second to the 3:19 Mathew Barzal gets). Lately, though, Lee’s contributions have been more in setting up others. He is 2-6-8, plus-5, over his last eight games. He has been dangerous on the road more recently, too. After recording only two goals in his fist 11 road games this season, he has seven goal in his last 12 road contests. Lee is 7-3-10, minus-5, in 19 career games against Washington. It would seem likely that Braden Holtby will return between the pipes on Friday night after missing a pair of games from taking a stick to the face in the Caps’2-1 overtime loss to the Columbus Blue Jackets last Saturday night. Holtby has had a preponderance of his appearances on home ice this season (19, to 12 on the road). His numbers are, in fact, better on home ice, both in his goals against average (2.70 versus 3.07) and save percentage (.916 versus .906). The strange part of his recent game overall has been the inconsistency. In his last 13 appearances, he had five instances of a save percentage over .940, and he had five instances of a save percentage under .890. Splitting the difference among them, his .906 save percentage in those 13 games is not what Caps fans might consider “Holtby-esque.” Holtby is 15-4-3, 2.39, .922 in 22 career games against the Islanders. This game has a large distraction attached to it, the first time Islander head coach Barry Trotz will coach a game at Capital One Arena since the Caps beat the Vegas Golden Knights, 6-2, in Game 4 of last spring’s Stanley Cup final. Trotz, who won the Jack Adams Award as the league’s top coach with the Caps in 2016, has to be on short lists for consideration to win the award for a second time this season. 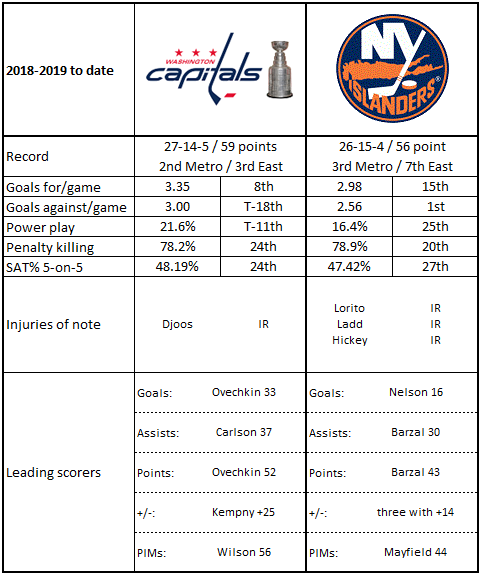 The underlying test for the Caps, though, is that the Islanders are playing at the top of their game. The Caps are not. If the effort/performance/focus level remains at the relative levels these teams established over the last month, it will be a difficult game for the Caps, who have alternated winning and losing streaks of three of more games (two each) over the last month. On the other hand, what more motivation could the Caps want to ramp up their effort than to let their former coach know that they are getting along just fine under new management?